As the first in a series getting an overview of what sort of things are in the Bible, we looked at the creation story in Genesis 2 and made our own version of the world on a paper plate. Cut sort-of semicircles from blue and green paper, except make the straight edge wobbly so that you get an interesting shape for the edge of the water. The idea is that the green paper represents land and the blue paper water. 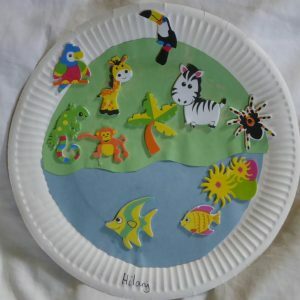 The children will glue the paper to the plates, and then stick the animals on. You can encourage them to put birds around the edge (in the sky), fish in the sea, etc.